Additional guest bedrooms to included: the Colonial Room, the Blue Room, the Pink Room, the Louis XV Room, the Gold Room, the Heliotrope Room, and the Green Room. Pottier and Stymus, who designed Whitehall’s interiors, named each room based on its primary color or decorating scheme. The Heliotrope Room, for example, is named for the lilac colored flower featured in the room’s wallpaper. Each room was restored to its original appearance, with patterned wallpaper and coordinating textiles reproduced using historical documents and photographs. 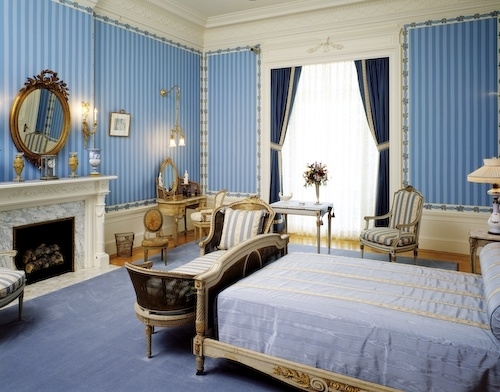 Some of the rooms, such as the Blue Room, are furnished with original pieces, while others are furnished with period pieces. The Gold Room furniture belonged to Flagler’s son, Henry Harkness Flagler, and his wife, Annie Lamont Flagler.